Panasonic practically invented the long-zoom 'travel' camera with its TZ series cameras, combining a long zoom range with a body slim enough for a jacket or trouser pocket. Over the years, the zoom range has got longer, the resolution has increased and the level of manual control has been extended to the point where the previous model, the TZ60, offered full program AE, aperture priority, shutter priority and manual modes, came with an electronic viewfinder and could even shoot raw files. But the problem with travel cameras is that the rely on small1/2.3-inch sensors, and the 18 million pixel resolution of the TZ60 was just too much for a sensor of this size – the camera had to use aggressive noise reduction at higher ISOs and this tends to produced smoothed-over images and textures. But Panasonic has taken a step back from high resolutions with the TZ70, using a high-sensitivity 12.1-megapixel sensor with photosites 1.5x larger than before. This is designed to give a much better compromise between resolution and low light performance for much better all-round picture quality. The TZ70 has a 30x optical zoom, offering a zoom range equivalent to 24-720mm, and a 5-axis Hybrid O.I.S.+ image stabilizer system combats any camera shake. Like its predecessor, the TZ60, the TZ70 comes with an electronic viewfinder, full manual control and the ability to shoot raw files. It can also shoot full HD AVCHD video. A control ring around the lens makes it easier to change camera settings and the autofocus speed is boosted by Panasonic's 240fps 'Light Speed' AF technology. GPS, Wi-Fi and NFC are built in. The Panasonic TZ70 has a control ring around the lens for adjusting camera settings. The TZ57 is a cheaper alternative with a 20x optical zoom lens and a 16-megapixel Live MOS sensor. It has a few more megapixels than the TZ70 but is not optimised for low light shooting and overall image quality in a range of conditions in the way that the TZ70 is. You don't get geotagging, Light Speed AF or an electronic viewfinder with the TZ57, but you do get a tilting LCD screen that's perfect for selfies! The Panasonic TZ57 is a cheaper alternative to the TZ70 with a 20x zoom lens. Both cameras will go on sale in March 2015. The TZ70 will cost £350 (about US$533/AU$659), while the TZ57 will cost £230 (about US$350/AU$433). The new SZ10 compact is made for social events and nights out, with a body designed to fit into a handbag or a suit pocket. Even so, it has an impressive 12x zoom range (24-28mm equivalent), optical image stabilization and Wi-Fi built in. The SZ10 can communicate directly with the Panasonic Image App on your smart device. An Instant Transfer function can automatically upload photos to your social networking site and you can operate the camera from your smart device too if you want to try out some selfies – according to Panasonic, 2014 was 'the year of the selfie', claiming that the word was mentioned 92 million times on Twitter. 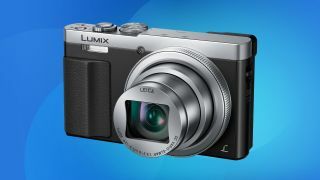 The Panasonic SZ10 is a compact but powerful snapshot camera for casual snappers and social events. The Panasonic SZ10 goes on sale in March 2015 and will cost £140 (about US$213/AU$264). Panasonic has also added a new 'rugged' compact camera. The FT30 is waterproof down to a depth of 8m, shockproof to a height of 1.5m, 'freezeproof' to -10 degrees and dustproof. A quick glance at the specs shows it's not the toughest compact camera on the market, but it does look handy, with a 4x 25-100mm equivalent lens, 16-megapixel sensor and effects like Creative Panorama and Time Lapse. An Advanced Underwater compensates for color shifts below the surface and a Torch Light function can add illumination in dark conditions. The Panasonic FT30 will be available in March 2014 in four colors (black, blue, red or orange) at a price of £140 (about US$213/AU$264).